Since launching five years ago, Blend has helped major financial institutions make lending decisions to consumers, in many cases narrowing the time it takes to close a mortgage by seven to 10 days. Today the company is releasing a mobile app that it believes will speed up the process even faster by allowing consumers to more easily communicate with their loan officer. Blend has raised $60 million in venture financing from firms like Founders Fund, Thrive Capital, Lightspeed Venture Partners, Andreessen Horowitz and others. But the company has mostly flown under the radar because it serves mortgage lenders, not the borrowers. Even if it’s helping to speed up the laborious process of applying for a mortgage, consumers are unlikely to know that the magic being done on the back end is powered by Blend. With the launch of its mobile app, that’s still the case… but it also should make a consumer’s communications with their loan officer move along at a much faster rate. In a perfect world, when applying for a mortgage, consumers wouldn’t necessarily have to interact with a human at all. But because it’s still such a large life decision, touching so many parts of their financial life, many actually prefer it. “When we were rolling out the initial parts of our product a few years ago, we realized that something between 40 percent and 60 percent of borrowers wanted to interact with a human as part of the process,” Blend CEO Nima Ghamsari told me. The problem comes when a situation requires the loan officer to respond. As Blend found out, those folks are frequently on the go, meeting clients, and are not necessarily able to be at their desks to reply to every email that comes their way. 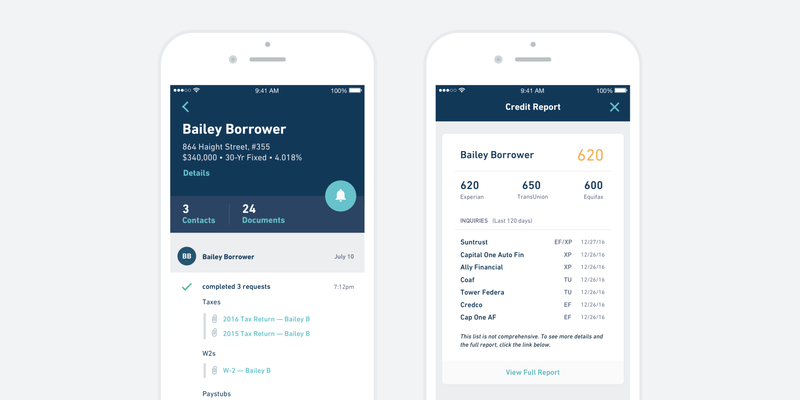 What the new Blend mobile app does is give loan officers the ability to provide them with all the information they need to respond to client questions in real time. The app highlights the client’s median credit score and a rundown of all the previous tasks completed and those still awaiting submission or approval. In that way, loan officers can also nudge consumers along in cases when it’s the borrower who might be holding up the process. The app notifies the lender after 48 hours of inactivity with their clients, so they will no longer go weeks without communicating while a mortgage hangs in limbo. The mobile app will be available to anyone who already has a Blend login. That includes loan officers at financial institutions like Movement Mortgage, Mason McDuffie Mortgage, RPM Mortgage, Guardian Mortgage, Opes Advisors, NOIC/Concord and SWBC. Blend has nearly 30 customers using its system today, but that’s likely to grow as the company continues to find ways to reduce the time it takes to issue a mortgage or other types of lending products.